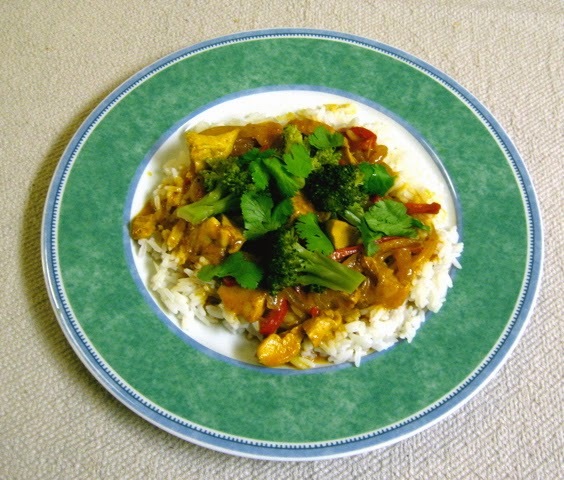 Where I Am Now: Can Curry Relieve Joint Pain? Absolutely! I discovered this by accident after I had a bad fall on the sidewalk and wrenched my knee. Fortunately, nothing was broken, but for a couple of weeks my knee was swollen and sore. In fact, for a few days, it hurt too much to bear weight on it and I had to use a cane. About a week after the fall, I had a craving for red curry. I was still in quite a bit of pain and it hurt to walk. So rather than hobble into a restaurant, I made a batch of curry at home. I noticed that about 20 minutes after I ate a big plate of it, my knee felt a lot better. Several hours later, the pain started coming back, which led me to wonder what was going on. A little research showed that turmeric, an ingredient in curry, has long been used in Chinese and Indian (Ayurvedic) medicine as an anti-inflammatory agent. Curcurmin, the volatile oil that gives turmeric its intense yellow color, has the advantage of relieving pain and a host of other conditions, without side effects. I have arthritis and have found that Western pharmaceuticals don't work for me. They simply don't relieve the pain. They do have a long list of side effects that would make them unacceptable to me for regular use, even if they did work. Since this discovery, I have been adding turmeric to soups, stews - wherever the flavor might be complementary - to keep my joints feeling better. If you want to try this at home, red curry is very simple to make. I "cheat" and use bottled red curry sauce. 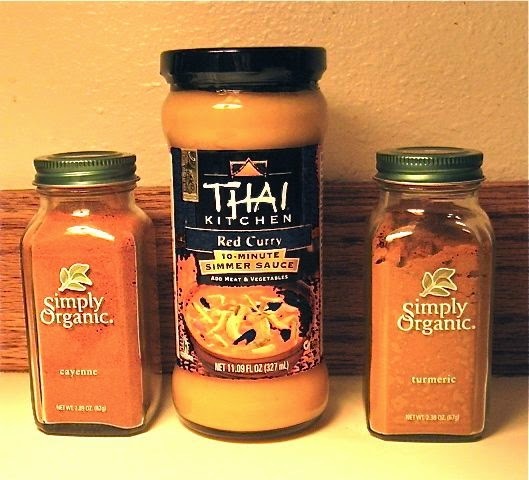 If I use the Thai Kitchen brand, available locally at PCC stores, I add more turmeric, cayenne and ground ginger to it, because I like more spicy flavor. I also use Trader Joe's red curry sauce which doesn't (in my opinion) need much extra spice. I start by sauteing vegetables. 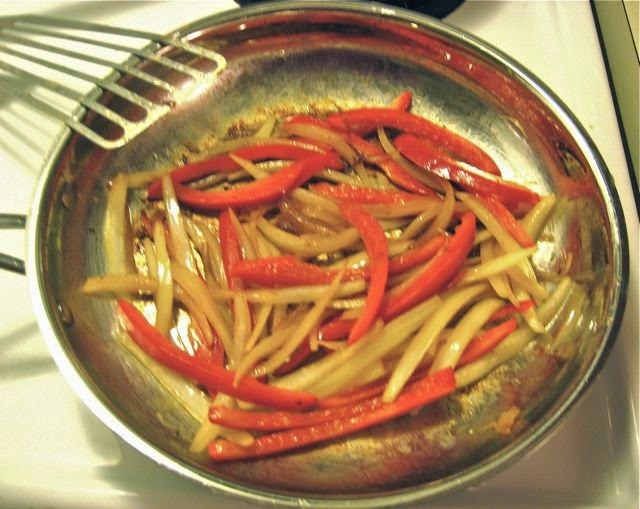 I like onions, garlic and red peppers, but you could use matchstick pieces of carrot or celery, whatever you like. When the vegetables are softened, I add the curry sauce and let the mixture simmer until the vegetables are cooked through. Then I add shredded cooked chicken or shrimp, stir and simmer another minute or two. While the sauce is simmering, I make rice and steam some broccoli. By the time the rice is done, everything else is ready to put onto the plate. I like to put down a layer of rice, top it with the curry, put the broccoli on top and then garnish with a generous amount of chopped cilantro. If I have a lime handy, I squeeze some juice over it all. And there you have it - As Hippocrates said, "Let your food be your medicine." Outlander Gardeners - Start Your Seeds!